The Pacific Tsunami Warning Centre has notified Russia and Japan of an earthquake in the Pacific Ocean, measuring 8.3 magnitude. 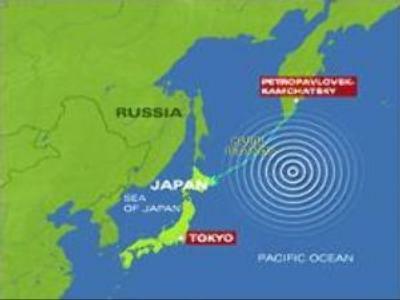 The quake struck about 500 kilometres east of the island of Itu-ROOP on the Kuril Ridge. The tremors could be felt on the Russian island of Sakhalin and on the Kamchatka peninsula. Japan's Meteorological Agency said waves as high as one metre could hit Hokkaido around 2 pm local time. Nikolay Smirnov, the head of the Emergency Department of the Sakhalin region, announced the Kuril Islands haven't been affected by a tsunami. He said no damage or injuries have been reported yet, but residents of the Kuril Islands have been evacuated to a safe area as a precaution. Meanwhile, reports from Tokyo suggest the tsunami warning didn't cause any disruption to life in Japan as local emergency services were well prepared. The wave that hit Japan was lower then expected and didn't pose any serious threat to lives or property. However an emergency committee has been set up by the Japanese Government to coordinate rescue work. A tsunami watch has also been issued for Hawaii, Alaska, Aleutian and Marshall Islands.